Being the only inhabited island belonging to the town Vodice, covered with Mediterranean "makija", vineyards and olive trees, with picturesque and quite bays, it is an ideal resting spot for those who favor the idyll of the island peace. The place was founded on the western part of the island at the beginning of the 17. th century when the church of St. Roko was built on the coast (1620th), and the new parish church of the Assumption (1878th) was built on the hill dominating in the settlement There is also a summer house of the family Draganic - Vrancic in the place, where the family armor and the portrait of the scientists, writer and historian Faust Vrancic from 1605th is kept. Placed on the eastern part of the island in the protected bay Luka. The place was founded by the Franciscan Glagolitic priests in the 15.th century at the same time when the church of the Madonna of Grace started to be built on the coast (1461st), in which there is the grave of Faust Vrancic. In the field Dolac there is a church of Madonna of Birth built in 1479th. 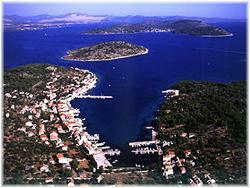 The island is very well connected by ship lines with Vodice and ?ibenik, and the accommodation can be found in private houses with food in restaurants. It leans on Vodice, becoming one of the favorite summer resorts for the admirers of peace and idyllic vacation in a small place due to its long and gentle gravel beaches and high quality accommodation in private houses and camping places situated along the sea coast. 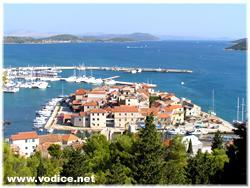 Well known tourist place situated 2 km away from Vodice at the foot of the hill St. Nicholas. The historical center was erected on the island with a stone bridge connecting it with the land. On the top of the hill St. Nicholas there is a church St.Nicholas (1452nd), and at the foot the parish church of the Assumption. Today, Tribunj offers to its tourists a high quality accommodation in private houses and camping places, and in the center of Tribunj, there is a marina with 500 berths and ferry boat pier. 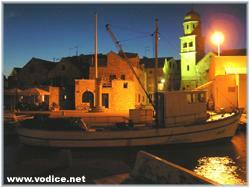 Tribunj is known in the regions especially by its rich selection of fish and shells offered in fine restaurants.